The RLJL Alarm Surveillance & Notification System™ (ASN) is a monitoring and control system capable of working in analog and digital environments. The system provides SCADA services as well as monitors, reports, and corrects potential service affecting conditions and failures in a network by using SNMP Traps, SNMP Polling, Pinging, Device Console Polling, and Syslog. The ASN provides an all in one solution on a Windows platform. The ASN has the ability to set alarm and notification thresholds ensuring that a notification is sent only when needed. Real time notifiction can be sent via voice, email, or instant message text to the assigned personnel. The ASN is not only a time-saving system, it is also a money-saving system in that it was primarily designed to mimic any human process. The ASN differs from other alarm notification systems because of its ability to not only take action on alarms but also notify. It has a built in programming language to give the user the ability to build programs to try and resolve the issue. For instance, if a card goes out in a switching system or a router, a small program can be built to connect to the system and execute, using the same procedures a person would do, to attempt and reset the card, interface, or system. If the procedure is successful, the ASN will notify and let you know what the issue was and what was done to resolve it and restore the service. If the process does not resolve the problem, it will notify and tell you what was done to try and resolve the issue and let you know it was not resolved. Using this procedure automation process, many callouts are eliminated as well as service outages being trimmed down from hours to mere minutes. The ASN Platinum 8 Port Controller is great for small offices and remotes. This controller is designed to mount in a 19’ rack, supports -48VDC power, and provides 8 contacts, 2 digital temperature sensors, and 4 relays,. This controller’s high speed Ethernet interface supports static or DHCP, and DNS name resolution. The controller’s LCD display will show sensor readings, contact closures, and any alarms as soon as they are present. The controller also supports the ASN generator monitoring box, for three phase, or single phase commercial power monitoring, as well as the New ASN Lightning sensor scheduled for release later this year. The ASN Platinum 8 Port Controller can be wired to the MDF frame or Optional In Rack Termination. This controller is designed to mount in a 19’ or 23’ rack, supports -48VDC power. The ASN Platinum 16 Port Controllers bring a new level of monitoring capabilities to the ASN. These controllers provide the ability to monitor contacts, temperature sensors, digital sensors, Analog to Digital (AtoD), pulse counting, as well as providing control relays. The Platinum 16 Port Controllers also support add on modules to provide terminal services, and data streaming for the new ASN DataLink moduel. This Module will be released in version 5 of the ASN. The controller also supports the ASN generator monitoring box for three phase or single phase commercial power monitoring, as well as the New ASN Lightning sensor. This Module will be released in version 5 of the ASN. The 16 port controllers can be wired to a MDF Frame Termination or an optional in Optional In Rack Termination for inputs to the controller. This controller is designed to mount in a 19’ or 23’ rack, supports -48VDC power. The ASN 32 Port Controller is the perfect option for large offices and remotes. This rack-mount controller supports thirty-two sense ports and eight control ports. The installation is made easy because the ports in this controller are wired through Amphenol connectors, which make the large number of ports easy to route to a frame block. This controller even supports DHCP, so integrating it into your network is a breeze. Another great feature in this unit is its built-in sensor support, which allows up to four sensors to be monitored. The LCD screen on the front displays sensor readings, contact closures, and any alarms as soon as they come in. There’s no downside to this controller; if you are looking for a heavy-duty solution for a big office, look no further than the ASN 32 Port Controller. Learn more about the powerful language that make this system so unique! 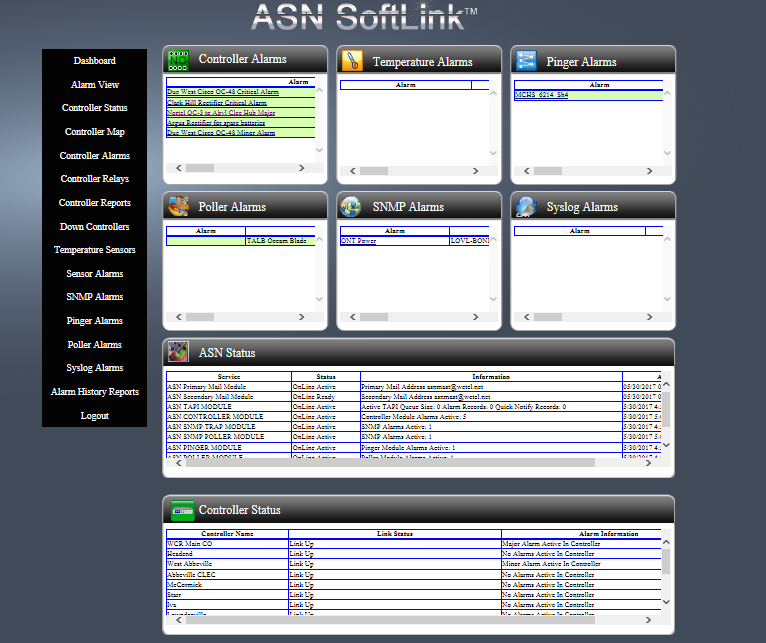 The SoftLink Dashboard provides a secure Web interface to the ASN, it has full user security allowing all users to view or change only the areas given to them by the administrator. SoftLink also provides a google map interface to allow your company a view of the network and any issues that may affect customer service. The alarm link module supports a proprietary encrypted protocol developed by DSC. This protocol provides for connection oriented devices to deliver trap messages or status information on the condition of the system being monitored. The advantage of this type of service is to ensure information is not lost from critical systems. The module is supported by tables in the ASN to take action on any predefined message received by the client device. Client devices can be controllers running Alarm Link software or Alarm Link clients running appropriate software. This module supports the ASN controllers. Each ASN controller provides contacts, relays, and sensors. The controllers can be local or remote controllers and are connected to ASN using TCP/IP. This module allows tables to be defined to generate a ping on the IP addresses of systems on the network. Tables include thresholds to be set that will trigger this ping at a predefined time. If the ping returns within the threshold, it will trigger an alarm event. This module supports the polling sessions used to connect to a switch or peripheral’s serial or telnet interface to send query syntax for alarm status. This module also supports SNMP Gets, Puts, GetTable, and MIBs. The Poller supports GUI interactions via the GUI Services Manager™. These procedures are triggered by the Polling Table. This module takes action on SNMP trap messages sent by SNMP agents on the network. The SNMP module provides tables that allow for agent and trap messages to be defined. These tables can be populated manually or imported. Once the tables are populated, action can be taken by this module when a matching trap message is received. The SNMP module also supports ASN poller agents on the network. The poller agents are designed to monitor and provide for special or custom tasks needed in your specific network. This module provides Syslog service to the ASN. The Syslog will allow for any host on the network with Syslog capabilities to send messages to this service. This module will log the data for future access by network personnel. It will also create and send summary reports via e-mail to network personnel on a scheduled basis. The module has a report generator that will generate specific reports and send to network personnel. The notification part of this module is triggered through tables in the ASN. These tables can be set up to look for specific trap strings from a specific host and execute a Button Object to do callout or special notification process. This module is responsible for the callout notification. It also includes the text to speech engine to allow text data to be spoken to the recipient of the notification over the phone line. The TAPI module also allows incoming calls to be received to request the status of messages in the ASN Alarm Queue and allows Button Objects to be executed by the calling party, providing the user has the proper security rights to ASN. All interaction with the Button Objects is done with the text to speech engine. This module can also be used to handle customer trouble calls, testing and dispatch. Click here to contact dscTech for more information on the Alarm Surveillance & Notification System™.